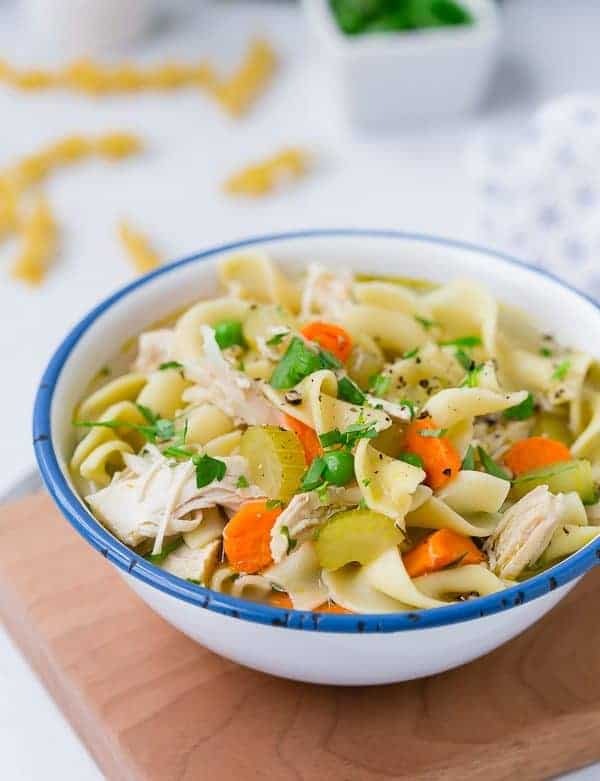 This cozy and comforting Instant Pot Chicken Noodle Soup is made easily and quickly in your pressure cooker. It’s comfort food at its best! I’ll be honest, I’m not typically a soup person. I’ve heard a lot of people say “I love soup!” and I just don’t feel that strongly towards soup. I mean I like it well enough, but I don’t love it. I’ll be friends with soup, but I’m never giving my heart to soup. With that being said, I do occasionally crave a warm bowl of soup. If it’s particularly chilly outside, or if I’m feeling under the weather…soup starts to look just a little more appealing. I do make soup occasionally – it’s quick and easy to make, typically. It’s warming, there are always leftovers, and it’s often healthy. This Italian Turkey Bean Soup is one of my go-to recipes because I often have all the ingredients on hand. It’s one of my favorite things to bring to new moms and dads, too. 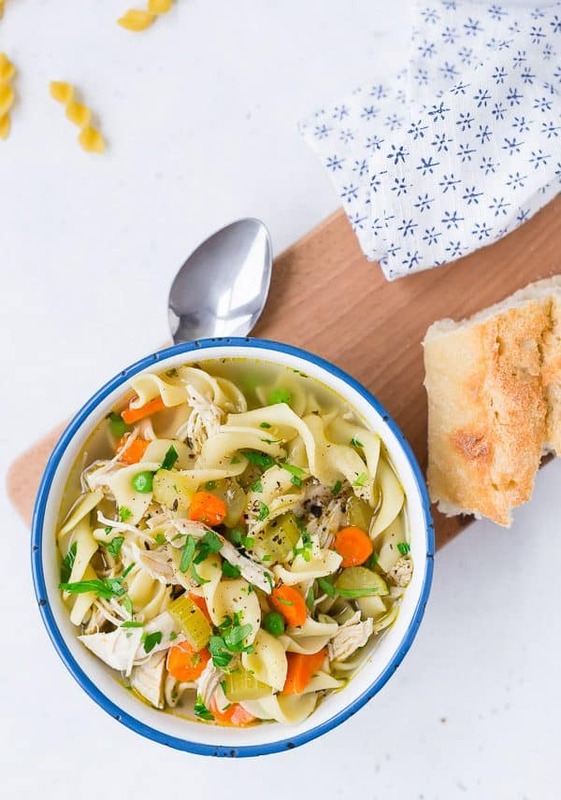 And what’s better than the classic…chicken noodle soup! Okay, french onion soup with a thick layer of cheese and bread might be better, but it doesn’t have the same effect on the common cold that chicken noodle soup does. 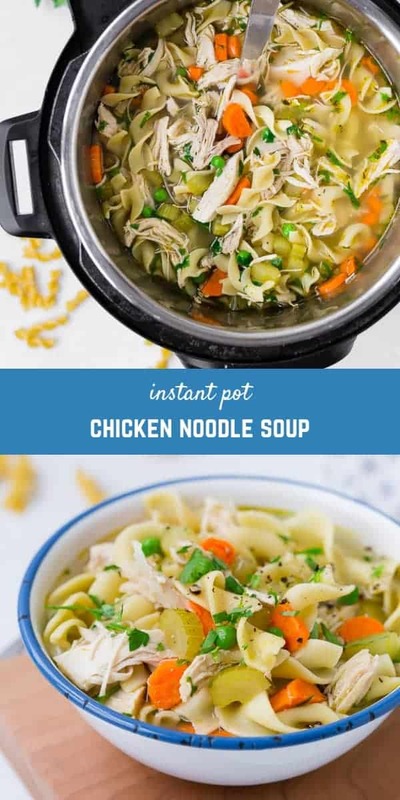 It’s made all in one pot, but that’s nothing new with chicken noodle soup, right? But this cooks quickly and without much supervision at all. The vegetables become perfectly tender, the chicken stays moist and is easy to pull apart and shred. 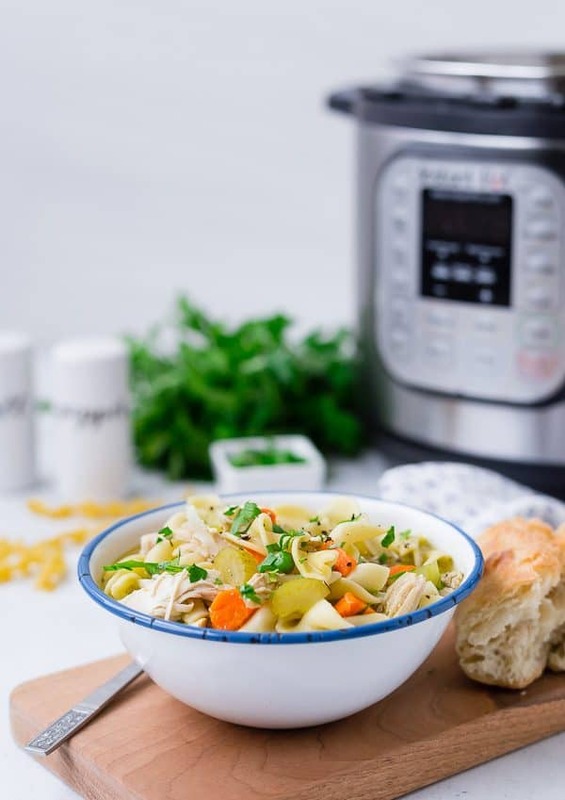 You can bring the soup back up to a boil right in the pressure cooker, and the pasta cooks in no time at all. Like Dark meat better? I used chicken breasts in this recipe but you could definitely use boneless skinless chicken thighs if you prefer dark meat. A mix of both would be great, too. Use different vegetables: If you like different vegetables in your soup, feel free to add them! Make it Gluten-Free: You could easily use a gluten-free pasta in this soup to make it gluten-free. I wouldn’t recommend a chickpea pasta or other pasta that creates a lot of foam. 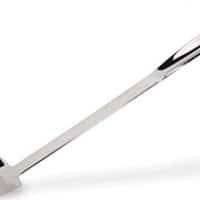 If you want to use one of those, I recommend cooking them separately and draining them before adding them to the soup. Make it Paleo: Not only is this paleo, but it’s also another gluten-free option. Use a spiralizer to spiralize zucchini and create zucchini noodles (aka zoodles!). Stir them in right before eating – they’ll soften quickly in the hot liquid. 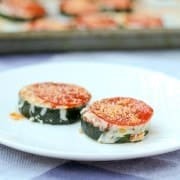 Make it Whole30: Same as Paleo! Try zucchini noodles. Omit the peas. Make it on the Stove: Very similar method to the Instant Pot method. You’ll sauté the vegetables in oil, add the chicken, broth, water, and herbs and simmer the soup until chicken is cooked through. Remove bay leaf and rosemary stem and discard. Remove chicken to shred. Bring to a boil and add your pasta. Cook until tender, return chicken to soup along with peas and parsley. 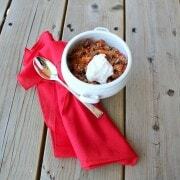 If you love soup, make sure to check out my Instant Pot Chili, with 101 variations! Okay, not quite 101, but a there are a lot. 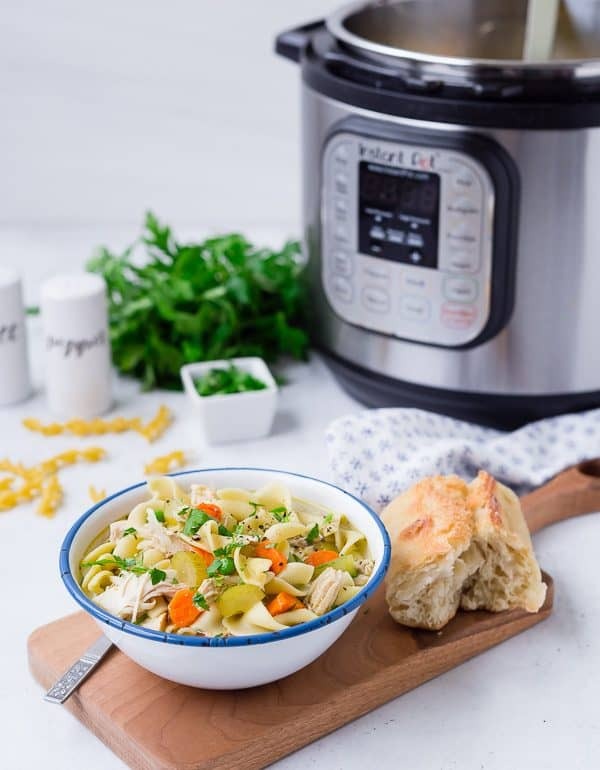 You’ll also love this Slow Cooker White Chicken Chili, the ever-popular Panera Squash Soup Copycat, Creamy Vegetarian Lasagna Soup, or Red Lentil Soup. If you want to take things to the next level, try serving this with A Couple Cooks homemade sourdough. This cozy and comforting Instant Pot Chicken Noodle Soup is made easily and quickly in your pressure cooker. It's comfort food at its best! Heat Instant Pot to "Sauté." Add oil, carrots, celery, onion, salt and pepper. Cook, stirring frequently, until onions are translucent. Add broth, water, chicken, thyme, bay leaf, thyme, bay leaf, and rosemary. Secure lid and turn valve to "seal." 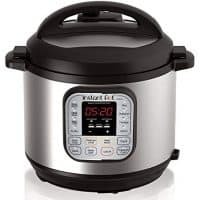 Set Instant Pot on Manual for 11 minutes. Quick release pressure when done cooking. Remove chicken to a plate, and remove and discard bay leaf and rosemary sprig. Turn Instant Pot back to Sauté. When soup comes to a boil, add noodles and continue to cook, stirring occasionally, until noodles are tender, or about 7-8 minutes (check the package for exact cooking time). Meanwhile, shred chicken with two forks and return to pot when shredded. When noodles have finished cooking, add peas and parsley and stir to combine. Taste and adjust seasoning for salt and pepper. You may also add more chicken broth or water if it's thicker than you like it. 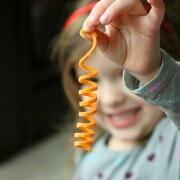 This recipe would also work well with whole wheat pasta. 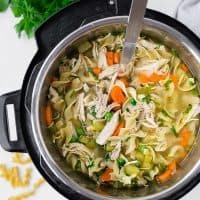 Verdict: This is probably my favorite chicken noodle soup recipe! 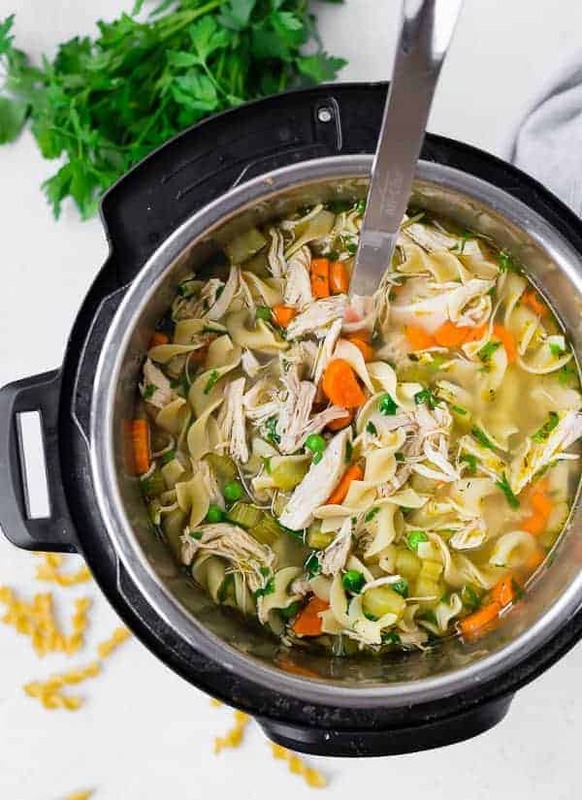 Husband’s take: Ben loves this Instant Pot chicken noodle soup! Changes I would make: None are necessary but try out some of the changes I suggested above! Ha, thanks for catching that typo! Should say boneless skinless chicken breasts. ;) Sorry about that, and thanks for letting me know! love this! 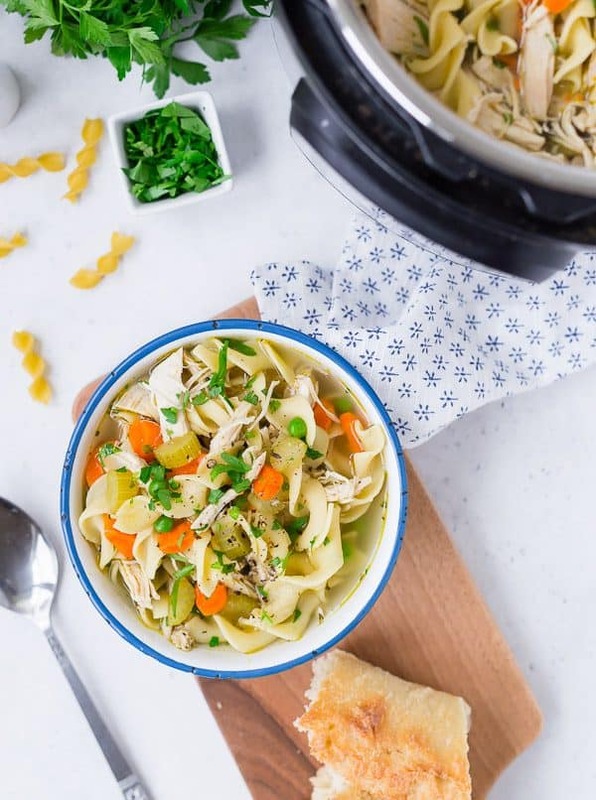 I made a similar one in my Instant Pot recently and it was a hit with the family.